The first annual meteor shower of the year is always the Quadrantids and it can be a good one with up to 100 meteors per hour visible at peak time. This rate is comparable to the superb Perseids and Geminids, but unlike these well-observed showers the Quadrantids are elusive since they have a narrow peak activity window that lasts just a few hours. Meteor showers are named after the constellation (or nearby star) where the radiant is located but you will have difficulty figuring out the associated constellation for the Quadrantids, the reason is it no longer exists. 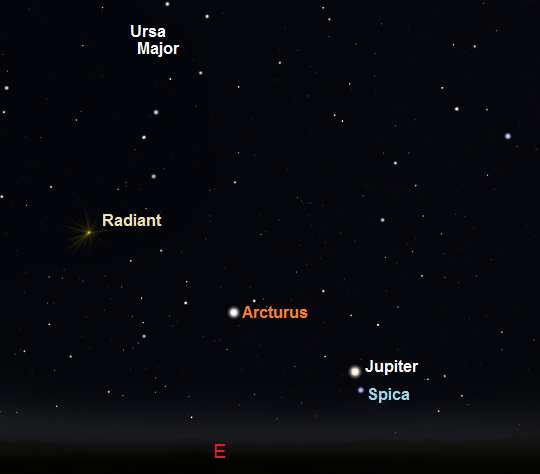 Today the Quadrantids radiant is located in the northern constellation of Boötes, not far from the tail of Ursa Major. 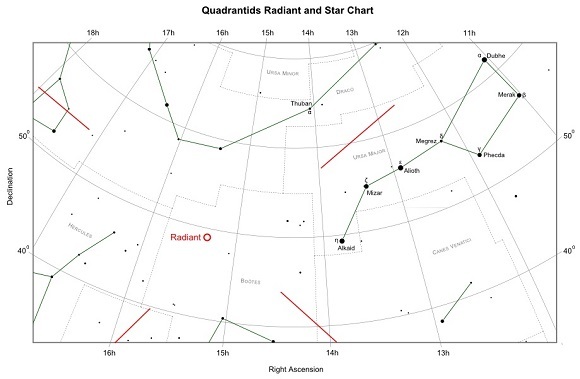 When the shower was discovered by Adolphe Quetelet of the Brussels Observatory in the 1830s the radiant was located in the now obsolete constellation of Quadrans Muralis, hence the name "The Quadrantids". Quadrans Muralis was originally created by Joseph Jerome de Lalande in 1795. This constellation represented the mural quadrant, a wall mounted astronomical instrument used for measuring star positions. Although no longer recognized by the International Astronomical Union (IAU), Quadrans Muralis is one of the better known obsolete constellations due to its association with the meteor shower. Since the peak of the Quadrantids is exceedingly sharp compared to other major showers the stream of particles that produces the shower must be relatively narrow. The recently discovered asteroid 2003 EH1 was proposed by Dutch astronomer and NASA senior research scientist Peter Jenniskens as the parent body of the Quadrantids. 2003 EH1 is likely to be an extinct comet and may even be related to the comet C/1490 Y1, which was observed by Chinese, Japanese and Korean astronomers some 500 years ago. Along with the Geminids, the Quadrantids are the only major meteor showers not originating from a comet. The Quadrantids are active for a few days but are notorious for their short peak activity window that lasts for only about 6 hours. In 2017, the shower is expected to be seen from January 1st to January 6th with peak activity predicted at about 15:00 UT on January 3rd. Prospects are good as the waxing crescent moon will have set during the evening hours. The best time to look is a few hours before sunrise on the mornings of January 3rd and January 4th. Most Quadrantid meteors are faint and slow moving with some appearing yellow or bluish in colour. Occasionally a few bright meteors can be seen. As with all meteor showers the meteor trails often streak across the sky quite a distance from the actual radiant point and can effectively appear anywhere in the sky. It's therefore a good idea not to look directly at the radiant itself but scan a large area of sky around it. Although they can be hit and miss if you have clear skies the illusive Quadrantids are certainly worth watching out for. Peak intensity window is brief, sometimes lasting only a few hours. Together with the Geminids they are the only major meteor showers not originating from a comet.